You could say we are passionate about outdoor adventuring here at TreeRunner Raleigh Adventure Park. After all, “adventure” is in our name! But that word can mean a lot of different things, depending on who you ask. What kind of adventures are we talking about? We are talking about obstacle courses and ziplining, of course! Our outdoor adventure park in Raleigh is made up of seven obstacle routes — each with its own difficulty, length, and height. From Beginner Courses to Intermediate to Expert, adventurers ages three through adults are sure to find something they’ll love here at TreeRunner Raleigh Adventure Park! But rather than tell our readers about the aerial adventure park in general, we’d like to focus today’s post on our zip lines in particular. More specifically, we’d like to offer up some tips for those of you who have never ziplined before. Truth be told, it can look a little intimidating at first glance, so we certainly understand any apprehension that you might be feeling. 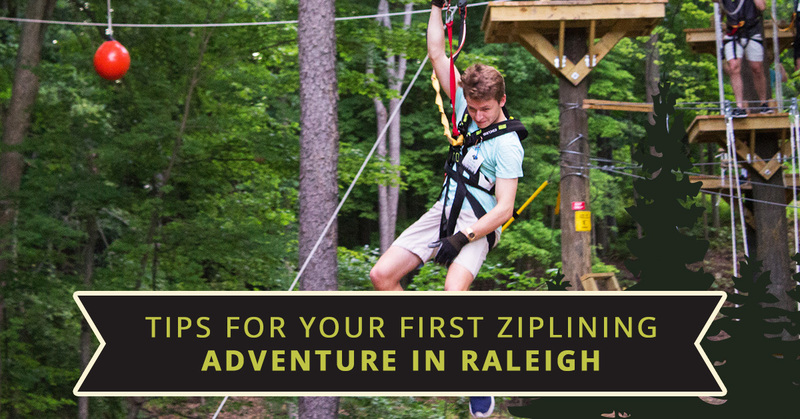 Once you read today’s post, however, we think you’ll feel sufficiently equipped to make a reservation at TreeRunner Raleigh Adventure Park and experience the thrill of ziplining for yourself! Let’s dive in. Wear Proper Clothing – Let’s start right off the bat with some practical advice: wearing the right kind of clothing will greatly improve your overall experience. Short shorts, flip flops, and skirts are a bad idea because you’ll be wearing a full-body harness around your legs and shoulders while ziplining. This is why we recommend wearing longer shorts or pants to make sure you are comfortable. Wearing closed-toed shoes are required as well (you’ll thank us later!). Listen To Your Instructor – Not to toot our own horns or anything, but we’ve been doing this for a while, so we know what we are talking about. Plus, we want everyone who walks through our outdoor adventure park to have a wonderful experience. We are highly qualified and invested in making sure you have a great time! If you have a question or feel unsure about something, don’t hesitate to ask us. Seriously. Don’t Take Too Many Pictures – Okay, this one is less practical — but it’s still important. We understand that taking selfies so you can post on social media later is part of life these days, but our one word of advice on the matter is to make sure you don’t let it get in the way of experiencing the beauty of the moment. Ziplining is a lot of fun, but you have to be paying attention to what’s going on to reap the full rewards! Follow The Rules – Safety is our top priority here at TreeRunner Raleigh Adventure Park, and that’s exactly why you can feel at ease when you trust us to provide you with your very first zip line ride. We make sure you know everything you need to in order to safely enjoy yourself! Just Relax – The final tip we’d like to offer up in today’s post is easier said than done; just relax. But in all honesty, you have nothing to worry about when you listen to your instructor and follow all safety instructions and protocol. It’s pretty much impossible to have a bad time if you just let the experience happen! Feel the wind through your hair and a little rush while you are at it. It’s wonderful. You’ll do great. Trust us! It’s all about creating some memories (without taking two hundred selfies), experiencing the outdoors, and having fun in the trees with people you love. 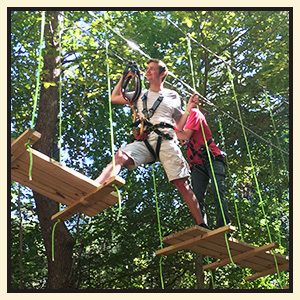 Perfect for birthday parties, school field trips, corporate outings, or even a date, TreeRunner Raleigh Adventure Park has something for everyone. So get outside, get some fresh air, and try ziplining for the first time! Book now.